Five years ago Pete Bodharamik was a 35-year-old with a big challenge. He had just taken over as chief executive of Jasmine International, the telecom holding company his father had started back in 1982. It was going through rough times, emerging from years in bankruptcy court after his father had diversified madly on borrowed money in the 1990s. 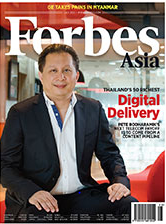 This entry was posted in Business, Uncategorized and tagged business, Forbes Asia, Pete Bodharamik, richest Thais, technology. Bookmark the permalink.